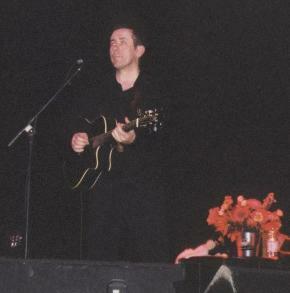 The Irish singer/songwriter Luka Bloom toured once again Germany in November. 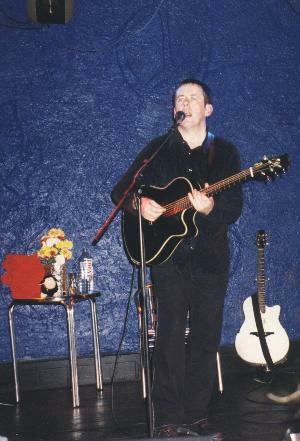 Marcus Metz went to meet him for an interview at his last gig in Germany, on Thursday, 11/11/99 at the Tollhaus in Karlsruhe. Where have you been recently? - "This tour started in Oslo on the 3rd of October. We were in Oslo and Copenhagen. Then we did about eight shows in Germany. And then I went in and did two weeks in Belgium and two weeks Holland - and then back into Germany again. So it's nice. I continue on till the 1st of December." Are you content with the audience? - "I seem to have a core audience in Germany that's not necessarily very big. I have that interesting relationship with Germany: I've never got things right. When I've had a great promoter I didn't have a great relationship with the record company. Earlier on when I had problems with the promoter I had a good record company. But next year I'm going to get it right. This is very difficult. It's very important to have a good relationship with people you work with particularly in Germany because it's a very big country and a lot of people want to come here. But I'm very fortunate in that. I seem to have a core audience. I coming to places like to Karlsruhe tonight. I've never played here before and there'll be 250 people here which - I think - it's amazing. So I just keep coming back in the hope one time I come back everything will be in place. I have a great promoter in Karsten Jahnke but the next time I come I am going to pay more attention to Germany." Do you think the audience in Ireland is different? - "Oh yeah, yeah! It's completely different. It's a even a difference in the audience in Holland - never mind Ireland. I find it amazing. It's a bit more predictable when you tour America. Cities don't change so much. But playing in Amsterdam is completely different from playing in Hamburg which is completely different from playing in Munich. I mean it's not just the difference Hamburg audience and Munich audience. I mean people are the same and they feel similarly. But just the way they react is different. There's a phenomenon in audiences in Germany that I find really amazing. There's a certain kind of warmth, it's a surprising warmth. In Holland and in Australia and in Ireland I'm used to people shouting all the time. But in Germany I find audiences really, really listening to you. But the way they respond is with this long applause at the end of a song. People don't shout or whistle so much but with this applause that sometimes goes on for ages (laughs) and you just have to stand there and wait for it to end... It's very kind actually." You just released an EP - it's a duet with you brother (Christy Moore)... - "Yeah, it's a song that I wrote last year which I wanted to record with my brother, and I did it last May. We really just recorded it. I wanted to have something for fun for summer in Ireland, it's like a summertime song for Ireland. But Karsten Jahnke liked it so much he wanted me to let some people hear it. That's no big deal, it's just something for fun." But this is the first time you did some recording with him? - "No, I played on a record of his in 1981." But not a real duet? - "No, never. That's the first time. That's true. First time we've done that, that's correct. It's difficult for us to do anything together 'cause we're quite different and our style of playing is different and the style of my singing is different. So it's not easy for us to get together in studio and for something really good to happen. When we get together at home with the family we sing songs together. But it's not a natural chemistry for us musically. 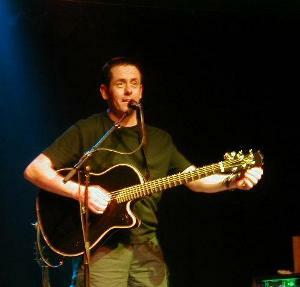 I knew it would work with him playing bodhrán, drum and me singing, playing guitar and he sang a bit also. It's good fun!" Will that be on the new album? - "Yeah! I don't know if he'll be on it but the song will be."